A couple of years ago, a well-known and highly regarded apologist sent his subscriber list an email article about finding a spouse. He began by explaining that when he was young, he made the mistake of thinking that liking and loving were basically the same thing, with the latter being just a more intense version of the former. As he grew in maturity, though, he learned that they are not the same at all, and that the chief difference between the two lies in the role of the will. “Liking,” he wrote, is a spontaneous emotional response to another person’s appealing characteristics. It’s outside the control of the will. “Loving,” on the other hand, is a decision, an act of the will. We can’t decide whom we like, but we can decide whom we love. Having laid down that basic distinction, he went on to draw the practical conclusion for marriage-seeking Catholic singles: Abandon as a childish fairy tale the idea that God has someone special out there just for you. “It’s not true,” he explained. On the contrary, “Within easy driving distance there are at least 100 people whom you could marry and have an equally happy life with.” After all, in olden days, marriages were arranged and often succeeded very well. He did not suggest that it doesn’t matter at all whom you marry, or that there’s no such thing as an imprudent match. Rather, his point was that since love is an act of the will, getting married is a matter of finding someone with good qualities and making a decision. 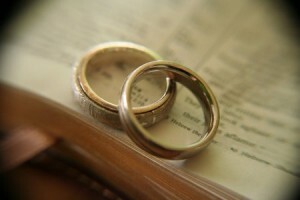 It follows that the cherished romantic ideal of marrying for love is naïve and out of keeping with Christian maturity. Shall I tell you what my first thought on reading this article was? “I feel sorry for his wife.” I feel sorry for any woman whose husband thinks he could have been equally happy with scores of women within easy driving distance of their home—never mind that he announces the fact to the whole world. But I hope he doesn’t really believe this. I hope he was just being excessively theoretical—advising from faulty notions rather than real experience. I hope this because the happiest married couples I know don’t think or talk like this apologist. On the contrary, they are filled with amazement and gratitude for their spouse’s love in their lives. They can’t imagine life with any other. Years and decades into marriage, they still marvel over the “accident” that they met each other, when they so easily might not have. They marvel over the surprise their falling in love was to them; how they never could have predicted it; how it changed their outlook on life, on themselves and on their sense of their future, including—maybe especially—their idea of where their true happiness lay. They are convinced that God had a hand in bringing them together. In short, they experience their love as a gift. Of course, in order for it to be rendered permanent and raised to the level of a Sacrament, conjugal love has to be sealed with a commitment of the will: “For better or for worse, in sickness and in health, until death do us part.” But it is not reducible to that commitment. Rather, the gift of conjugal love precedes,* inspires and informs the marriage vows. Recently re-reading Raissa Maritain’s memoir, We Have Been Friends Together, I came across her description of her growing attraction to her fellow student and future husband, Jacques. They had met by chance outside her physiology class at the Sorbonne and soon became inseparable. For the first time I could really talk to someone about myself, emerge from my silent reflections in order to share them… For the first time I had met someone who at the outset inspired me with absolute confidence; someone who from that moment I knew would never disappoint me; someone with whom I could so readily come to an understanding on all things. Another Someone had pre-established between us, and in despite of such great differences of temperament and of origin, a sovereign harmony. 1) She doesn’t speak of Jacques’ “objective qualities.” She’s not talking about the fact that he’s intelligent, upright, good-looking, from a prominent family, etc. She’s not looking at him from the point of view his suitability for the role of husband. Instead, her description of their incipient love is entirely focused on the deep and mysterious interior harmony she is surprised to discover between her soul and his. 2) Note that her attraction is a spontaneous, affective response—not to “appealing traits” merely, but to him, to his person. 3) They were unbelievers at the time they met, but she recognizes God’s design in that harmony, and God’s hand in bringing them together. Could Raissa Maritain have been equally happy with 100 other men in Paris? The question is so far off the mark as to be almost offensive. no need to struggle between motives. The answer had almost been determined. to catch the weft that determines a fabric’s pattern. and at the same time I accepted the fact that I had to. I thought there would be no point. There must have been something in Teresa that suited my personality. I thought much at the time about the “alter ego”. None of this is to suggest that falling in love is a matter of sheer affectivity, never mind hormones. Andrew says a few lines later that his love for Teresa meant he had to deliberately turn away from the sensual allure of other women he encountered. But his love for her wasn’t brought into being by an act of the will. That is the essential point I want to drive home. Rather, he received it as a gift from God. It was a powerful, spontaneous movement of two souls toward each other, which was then (gradually, over time) recognized as good and sanctioned with his will. Conjugal love is something too great and mysterious, too beautiful, and too God-fraught, to be adequately defined as an act of the will. Catholic teachers do an injustice to reality and a disservice to lonely hearts when they speak of it that way. * There are exceptions to this rule—cases in which love comes only after the commitment of the will. Think, for instance of a widow who marries a good man she respects, in order to give her children a father and provider. In such a case, a genuine conjugal love may eventually develop between them. But these cases fall short of the ideal. I think that there is a balance here, because many have noted the possibility of ‘falling out of love’ something I hope I never experience. But certainly some people get married then suffer disillusionment with their spouse. so then loving becomes an act of will, remembering why one was married and what marriage is for. I think that one thing neglected by the apologist and also, to a lesser extent, although hinted at the the article. Is the will of God. There are many people in the world one might love. But as marriage is an exclusive sacrament, God does not will a person to be married to more then one of those people and as he ‘knows all’ and cares so much about us that ‘even the hairs of our heads are numbered’. Then obviously he has a plan. The question is are you trying to resist it or humbly submit to it. It’s important to stress, I think, that the apologist was addressing Catholic singles, not married couples, who have made their love permeant with solemn vows. But, even IN marriage, even in the sort of case you mention, where the exalted feelings of in-loveness that naturally accompany courtship are lost or diminished, I don’t think it’s quite right to say that love becomes an act of the will. I think you forget to capitalize the “TO” in “TO LOVE.” Loving someone is at its most fundamental level an act. When you love someone, “love” takes the place of the verb. “I love you” — in that statement you are asserting that you are doing something to your beloved. Furthermore, I think you raise an important issue that you don’t address. If love is not an act of the will, then what is it? (yes the title is “Conjugal love is not an act of the will” but conjugal love is contained within love at its most fundamental level). The idea you seem to be backing is that love an emotional state (please, correct me if I misunderstand you, and if you can, please also expound then on what you define love as). But that is a terribly limiting view of love, especially considering how fleeting our emotions and feelings can be. I do sincerely believe that our emotions and sentiments can add an exciting and extremely enjoyable aspect to conjugal love. But, in no way do they make love truer than when not present, for this reason: Which case has more true love — “I love you, and I know it because of the feelings and emotions I experience when I’m with you.” or “I love you, and no matter how or what I feel, I will always remain committed to you and your good.” ??? First, in the article I contrast “act of the will” not with “emotional state”, but rather with gift. When two people fall in love in a deep, reciprocal, authentic way, they are not deciding to do something; they are receiving a gift from God. What that love is, as the great Catholic thinker Dietrich von Hildebrand has shown so luminously and convincingly, is a response of the heart to the heart of another. It is not sub-rational; it is supra-rational—a fully free and fully spiritual response, like the holy joy of St. Francis or the grief of Jesus over the death of Lazarus. Of course, to reach its fullness, conjugal love has to be sanctioned with the will. It has to be purified of all ego-centrism; it has to be suffused with the divine love of agape. We have to say yes to it–not just finally, on the altar, but constantly, even as it grows within and between us, and later as its emotional intensity diminishes over time. We also have to thank God for it, because it is a gift beyond our deserving, and not creation of our will. The receipt is an act of the will. And frequently you have to seek out in order to find. Alot of these conversations hide a basic agreement–and when a difference of emphasis becomes perceived as a principle of exclusion. Marital affection should be about the will and should involve a certain captivation as well. White-knuckled raw willing love IS sometimes necessary in marriage, especially in the worst of times, but no one should get married that way. But I insist (1) God made us so that we are fall-in-love-able, (2) so there are many one could fall in love with, and (3) this insight is hopeful to many singles who long for the joys of offspring, fidelity, and sacrament, and (4) it’s helpful because the marital enterprise requires prayer AND action. Here you set up a false alternative. In the first case the speaker is entirely ego-centric. He is deriving the fact that he loves from the way that he feels. But this is nothing like the true experience of conjugal love, which is focussed on the other. The REASON I commit myself, in love, to my spouse, is that my spouse has won my heart. And, once having given it to him, I OWE him not only the commitment of my will, but all my love–“in season and out of season”. On your first case one is a taker and he other is a giver. Two givers are needed for love to be true. I would say two givers, and two receivers, are needed for conjugal love to reach its fullness. But even an unrequited love can be a true love–true in the sense of being a genuine response of the heart to the beauty of the other, rather than a mere infatuation or an ego-centric wallowing in sensation. Love can be true without being returned. True: a wise priest told me–look for (1) physical attraction, (2) emotional attraction, and (3) shared values. You gotta have all three. Love is a decision, but you must bring prudence (including a frank acknowledgement of your own limitations) as well as will. According to your bio, as I suspected, you met your husband as undergraduates. Frankly, your advice is very unhelpful to people who have to actually work at finding a spouse–and indeed, is a cause of despair. Honestly, I learned very little of value about searching for spouses from the high-school sweetheart types; they simply didn’t understand the problem. Probably the most despairing thing I heard was the, if you have doubts at all, then it’s not meant to be. That junk works when you’re 20, not when you’re 35, when you know too much not to have doubts. What many older singles need to learn is this: there ARE many fish in the sea, and there ARE many people you can fall in love with. Don’t just sit around rejecting everyone who doesn’t fill you with (chaste!!!) ecstasy. We are ALL fearfully and wonderfully made–and what you should be searching for isn’t “the ONE,” but the eyes to see the immense beauty of a future husband or wife, along with the prudence in choosing–the gift to see just a glimpse of what God sees. And you frequently have to CHOOSE to pursue these things, sometimes with great effort of will, and always, with prudence. I am very gratefully married to a wonderful wife, and I thank God that He gave me the prudence to discern and the will to pursue (including ALOT of setbacks, and ALOT of doubts). The article may be well-intentioned, but is ultimately based on a false premise, that is, that conjugal love is capable of existing apart from the will. In fact, the oposite is true and common at times in marriages. Sometimes the act of the will, the commitment, is what keeps the conjugal love strong, not any warm and fuzzy feelings. Those are great, but ultimately unnecessary. In fact, God, through the Church, acknowledges this truth by teaching that a willful commitment is a necessary component of conjugal love while never teaching that warm and fuzzy feelings are a necessary component. As for after marriage, I once heard it expressed (paraphrase) “A man is one flesh with his wife, even when he wishes he wasn’t.” I’m a newly wed, so obviously I’m speaking from theory more than experience, but I think that God-given attraction and love for the other is something that persists, even after the ‘warm fuzzies’ are gone. It might even become something of a cross to be so wedded to a person, spiritually as well as physically.